Vishvas Chalishazar, Kamesh Mullapudi, and Sharmin Kibria took top honors for the School of Electrical Engineering and Computer Science at the Oregon State College of Engineering’s Graduate Research Showcase. The three also presented their research posters at the Oregon Stater Awards ceremony a week later, where they were able to meet with distinguished alumni. In the summer of 2003, a massive blackout occurred in the power grid in the northeast United States and Canada, resulting in a loss of power for two days, affecting 55 million people across eight states and Ontario. The cause of the outage was traced back to the grid’s control center failing to identify few anomalies in measurements and not providing an accurate analysis of the problem. Because the control center was unaware of the situation, it wasn’t able to take preventive action in time, and the fault spread throughout the interconnected grid. Working with Jinsub Kim, assistant professor of electrical and computer engineering, doctoral student Sharmin Kibria is looking for ways to prevent power outages, big and small. She is developing better ways for control systems to detect and identify anomalies in measurements and fix issues before they become problems. Conventional methods for detecting anomalies in measurements rely on measurements collected by sensors at only a single time point of interest. In Kibria’s algorithm, the sensing system scans the grid continually — every two to four seconds — to obtain readings from multiple time points and use them to enhance accuracy of measurement correction. The key idea is to exploit a generic property of anomalies in a sensor network. Specifically, their locations tend to be invariant over multiple measurement periods. “We can accurately identify where the error is and throw out corrupted data and use healthy measurements,” Kibria said. Kibria tested her proposed algorithm on a model of a portion of the New England power grid and it outperformed the benchmark technique that uses single measurements, showing great promise for a better system that won’t leave us in the dark. 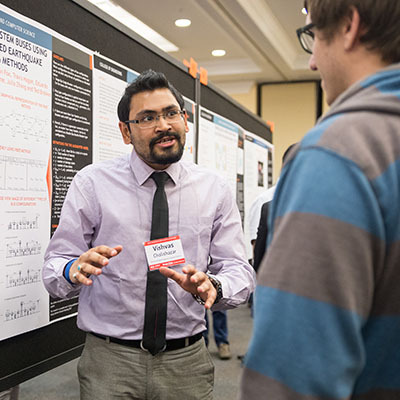 First place winner Vishvas Chalishazar, a doctoral student in electrical and computer engineering, is working with the energy systems research group to help make sure critical buildings, like hospitals, remain functional after an earthquake. “The main idea is to make the whole electrical grid more robust, more resilient, and add more redundancies,” Chalishazar said. Although it is impossible to ensure that the entire grid never loses power, Chalishazar is working to figure out which nodes in a grid will likely become impaired and help electric utility companies develop their plans to shore up specific assets in their grids. Under the guidance of Ted Brekken and Eduardo Cotilla-Sanchez, professors of electrical and computer engineering, Chalishazar developed and ran one million simulations on a simple 3-bus electrical grid model. His next step will be to develop and apply simulations to the Oregon State University’s Corvallis campus grid, which consists of 286 buses. The energy systems group is working with the Central Lincoln People’s Utility District, Portland General Electric, and Pacific Power to research grid operation, planning, and analysis methods for improved resiliency. Many scientists have been predicting that the death of Moore’s Law — that the number of transistors on an integrated circuit (IC) doubles each year — is imminent, but electrical and computer engineering doctoral student Kamesh Mullapudi is working to delay its demise. IC manufacturers are currently working on developing and producing 10-nanometer node transistors. These transistors — some of them just 50 atomic layers across — are so small that finding defects on chips is challenging. Optical and electron microscopy techniques currently being used to detect defects, are inadequate and impractical for transistors that make up the latest microprocessors. Magnetic resonance can detect defects on this scale, but the giant magnets required are not practical and expensive. 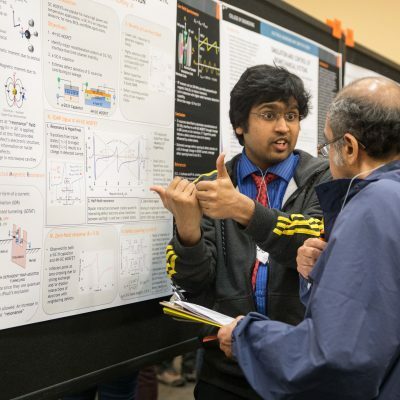 To overcome these obstacles, Mullapudi is working with John Conley, a professor of electrical and computer engineering, on using low-field electrically detected magnetic resonance (LFEDMR) that uses small magnets and is extremely sensitive. This technology can help pinpoint not only which chips are defective on a wafer, but can help identify the cause of a particular defect. In the chip manufacturing business, yield loss (the number of defective chips on a wafer) is costly. “We’re working with Intel to develop the LFEDMR technique to a scale that is implementable in industry and ultimately increase their yield and profitability,” Mullapudi said. Braxton Cuneo, Erich Kramer, Andy Tolvstad, Karen Harper, and Aaron Schraner (left to right) advanced to the world final of the 2017 Rohde & Schwarz Engineering Competition. 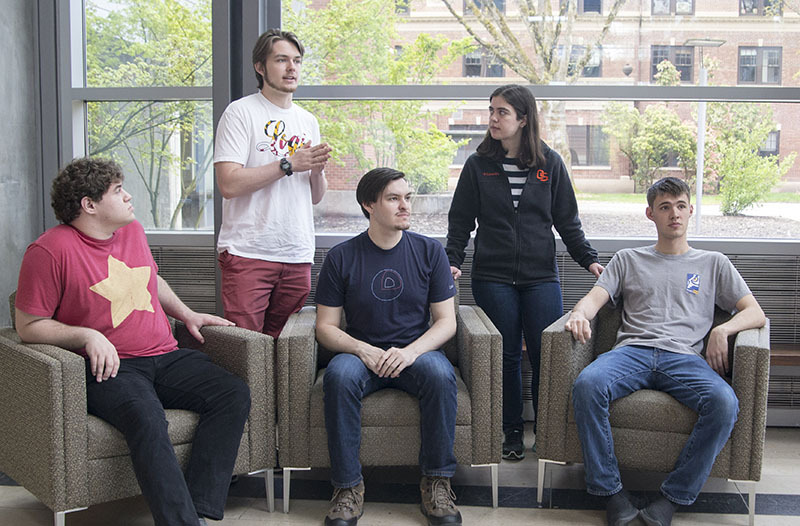 Five students in the School of Electrical Engineering and Computer Science will be heading to Germany this summer to compete in the 2017 Rohde & Schwarz Engineering Competition. Their performance in the U.S. preliminary round earned them a spot at the world league competition. Aaron Schraner, an electrical and computer engineering student, was motivated to compete since he participated last year on a team from the Oregon Institute of Technology that won the 2016 regional competition. Based on his experience there, he recruited Karen Harper for additional electrical engineering knowledge. All the other team members are in computer science: Braxton Cuneo, Erich Kramer, and Andy Tolvstad. Their task was to make improvements to software for a digital-signal processing application that could ultimately make video streaming better. Specifically, they were asked to speed up the processing of the software-based DVB-T2-Coder, based on the open source GNU Radio project, while maintaining accuracy. “Signal processing is traditionally very, very computationally intensive, so any optimizations you can get out of something like that are going to be very beneficial to your workflow,” Andrew Tolvstad said. “There was one loop we optimized that was run about 1.2 million times,” Karen Harper agreed. “Just by changing a data type that was 32-bits wide to one that was 64-bits wide, we took another 5 to 10 percent off the total amount of time it took to run the program,” Aaron Schraner said. During the competition, students made improvements to the code that was then automatically compiled and tested for performance once they submitted it via Git. Rohde & Schwarz continuously published a leader board of the top performing teams so the teams could watch their ranking move up or down. The team members are excited to have an all-expenses paid trip to Germany, and are squeezing the trip into very busy lives of classes and internships. They also have a chance to win $3,000 for the top prize, $1,500 for second place, and $750 for third place. But the money was not the only objective. This final will be held in Munich, Germany at the Rohde & Schwarz headquarters. Rohde & Schwarz is a privately held company with over 10,000 employees worldwide, including a design center in Beaverton. Posted in Awards, Student Stories. 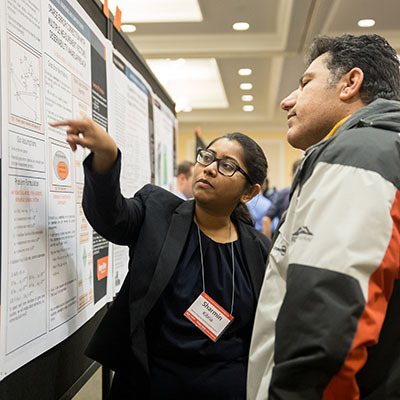 © 2019 OSU EECS News, all rights reserved.